Hi. My mothers aunt found this in 1988 at a dump in southern jutland in Denmark. Close to the German border. I've had this teddy bear since then. It's good luck that I took so good care of it. Now when I'm a grown up, I can see that this bear is old. Now I'm wondering how old it is. This bear growles if I turn him over and around. 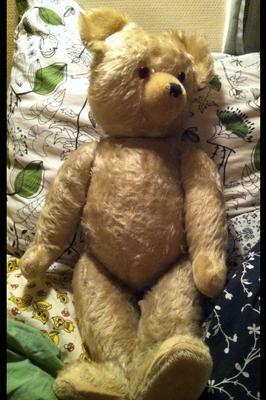 I've read a bit about antique teddy bears now. But I'm so confused. The teddy bear, don't have any tags. Something that really strikes me, is that it dont have any pads on his feet. Not felt nor cotton. It's just a short grass like surface with hair. Very soft. I'm wondering if it had pads i the past, and someone maybe removed it? And the surface i'm seeing is the layer which should be beneath the pads? Anyway. I've checked. The bear have glass eyes. Sewed in with tread from a metal hook who is attached to the glass. The bear has handmade stitches on the back. The joints is movable in the arms, legs and neck. He has long legs and big feet, but not narrow ankles. He has curved paws. But no stitches to simulate claws. The stuffing crackles. It feels hard, I think it might be straw or something. I think its the same stuffing in the head, as I feel inside his body. Can anyone please help me identify my childhood and adulthood companion ;) ?? By the looks of the photo and by the description, the paw pads sound like they are made of a crew cut mohair of comparable color to that of the rest of the body. The muzzle looks like it might be the same fabric. What do you think? As you thought that he's homemade the probability of him having pads is low, I haven't seen a bear of his sort before and its odd that hes jointed if he is homemade. So, he was either made by by a company or a skillful creator. I'm sorry to not be of more help though.